NEET which is also known National Eligibility and Entrance Test led to a suicide of a 17 year old Dalit girl Anitha who wanted to be a doctor. Her mourning father told that she was preparing for the examination under extreme circumstances and what was her fault in that that it led to her death. The girl scored well in class XII with 1,176 marks out of 1200 but due to certain reasons could not score well in the NEET examinations and as a result could not join MBBS course and ended her life in Ariyalur District on Friday. She was a daughter of a daily wage labourer who used to travel from far away distance, from Kuzhumur village near Sendurai to earn some living for his family was one of the respondents in a Supreme Court Case challenging NEET. Her protest and death worked as a wake up alarm for the politicians and social activists who were exempting the state from NEET. Aftre her death which triggered the state, the Chief Minister of the state Edappadi K Palaniswami offered to pay Rs 7 lakh to her family members as an amount of compensation for the loss being caused. If medical admissions would have been held on the basis of just Plus Two results that happened every year and is happening since decades, she Anitha would have got admission as she scored well in Physics, 199 in Chemistry, 194 in Biology and would have secured a cut-off of 196.75 out of 200. 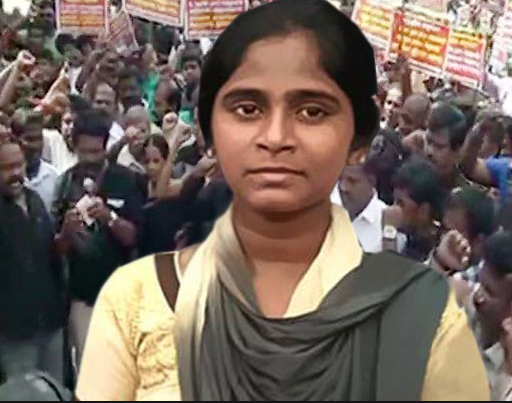 Her suicide has spread a rage on the roads of Tamil Nadu as angry villagers surrounded her house in protest against the government who failed to get the state exempted from NEET and crushed the dreams of lakhs of students like Anitha. We mourn Anitha’s death and hope that her soul rests in peace.